Gov. Mike DeWine greets folks as he enters the National Afro-American Museum & Cultural Center in Wilberforce. Scott Halasz | Greene County News Gov. 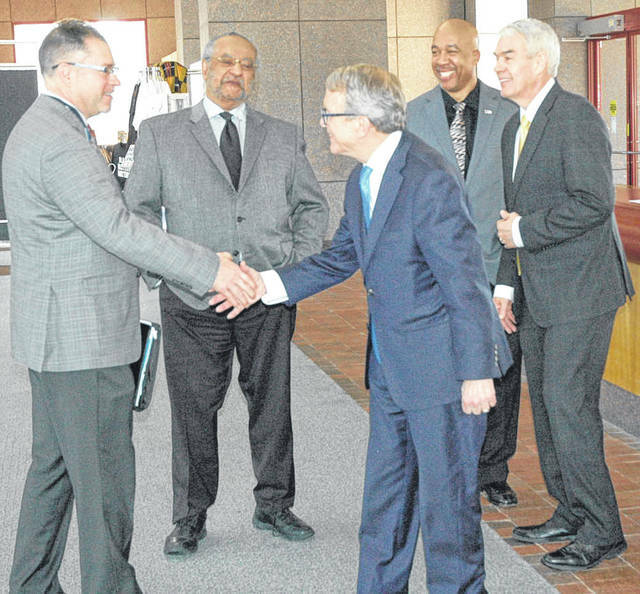 Mike DeWine toured the National Afro-American Museum & Cultural Center in Wilberforce Feb. 4 to kick off Black History Month. Among the exhibits DeWine saw was one containing several resolutions passed in making Dr. Martin Luther King Jr., day a holiday in Ohio. Gov. Mike DeWine takes a closer look at an exhibit while museum Executive Director Dr. Charles Wash looks on. WILBERFORCE — Calling it a hidden gem, Gov. Mike DeWine kicked off Black History Month Feb. 4 by visiting the National Afro-American Museum & Cultural Center in Wilberforce. 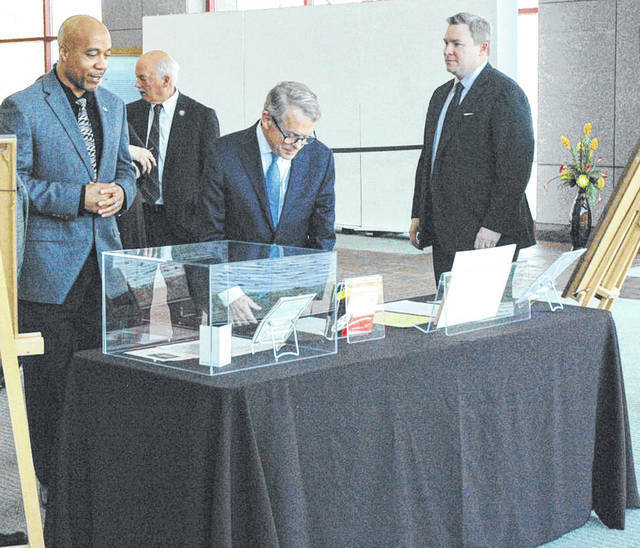 Along with Department of Higher Education Chancellor Randy Gardner, Senior Vice Chancellor Mike Duffey and Vice Chancellor Charles See, DeWine toured the museum adjacent to Central State University, taking in the many displays and exhibits. DeWine, a Yellow Springs native and Cedarville resident, said he wants to “hold up some of the great things in Ohio that are destinations” and specifically the Dayton area. Before visiting the museum, DeWine ate breakfast with Central State University students, making the Greene County institution his first official college visit as governor. Early childhood education is an important item on DeWine’s agenda. He wants to make sure there are enough teachers to help mentor students. “It’s important that young African-Americans have a role model in these classrooms,” DeWine said. https://www.xeniagazette.com/wp-content/uploads/sites/32/2019/02/web1_DSC_6590.jpgGov. Mike DeWine greets folks as he enters the National Afro-American Museum & Cultural Center in Wilberforce. https://www.xeniagazette.com/wp-content/uploads/sites/32/2019/02/web1_DSC_6593.jpgScott Halasz | Greene County News Gov. 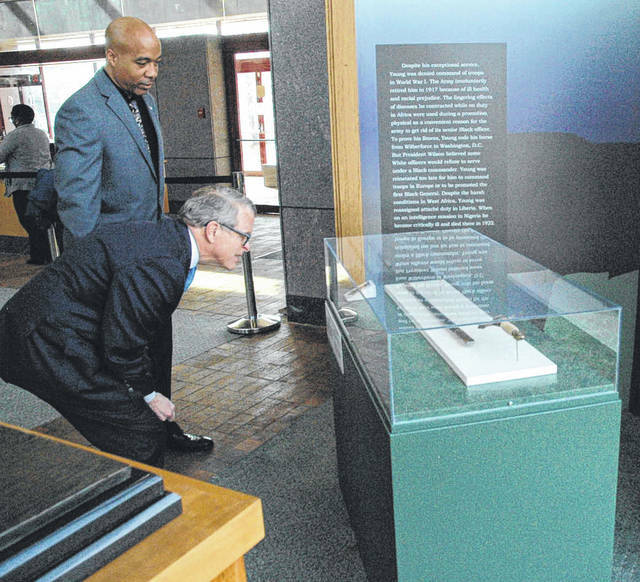 Mike DeWine toured the National Afro-American Museum & Cultural Center in Wilberforce Feb. 4 to kick off Black History Month. Among the exhibits DeWine saw was one containing several resolutions passed in making Dr. Martin Luther King Jr., day a holiday in Ohio. https://www.xeniagazette.com/wp-content/uploads/sites/32/2019/02/web1_DSC_6591.jpgGov. Mike DeWine takes a closer look at an exhibit while museum Executive Director Dr. Charles Wash looks on.